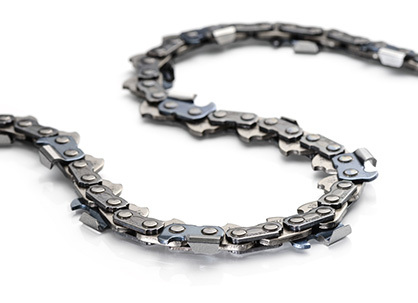 The 19HX chain is optimized for modern high-flow, high-power heads and saw motors for faster cutting speed. It features tall chamfer chisel cutters that combine best-in-class durability with improved chip clearance, to deliver faster and more consistent cuts in all types of wood. A new, taller and more aggressive chamfer chisel cutter is designed to deliver faster cutting speed compared to 18HX. Oregon's largest and thickest .404 components are designed to provide improved strength and superior durability compared to 18HX. Patented saw chain steel provides proven Oregon durability, especially in cold cutting conditions. Blued cutters provide superior corrosion resistance. Recommended for use with rim-type sprockets only.